Do you know what to look for when shopping for title software? 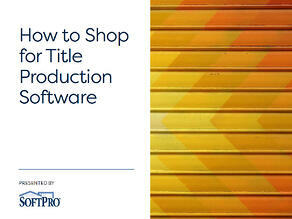 Download the e-book to read 7 things to consider before purchasing title production software. Download the e-book to learn what questions you should be considering to ensure you're purchasing the best software for your company. Any major decision or purchase is a big deal, both emotionally and financially. If it happens to relate to your title business, there can be an extra layer of stress. So, if one of your looming choices this year is to select a new title production software vendor, we’re here to take that angst away. Your production software should be a tool that helps you save time and money, not be a hindrance. When searching for a new provider, you need to make sure to evaluate everything a company has to offer, not just its sales pitch. Here is a checklist of seven questions you should use when searching for the best vendor for you and your company. What are the included features/integration possibilities? How does the company harness the power of automation? Is the company dedicated to the protection of you and your customers’ data? Is the company more than just a software supplier? Can you test the product first? Is the software a good value?